In a recent study published in ACS Nano, researchers advanced the current understanding of defect structure/evolution and structural transitions in 2D TMDs, which is crucial for designing nanoscale devices with desired functionality. The combination of machine learning, HRTEM, and atomic simulations reveals details of atomic structure in two-dimensional molybdenum disulfide MoS2. The HRTEM sector captures the distribution of defects after 120 sec of defect growth. The machine learning sector shows an atomic snapshot after 1 nanosec of molecular dynamics (MD) simulation (blue lines are extended defects), and the atomistic simulation sector zooms in on the machine learning snapshot and shows atomic details. 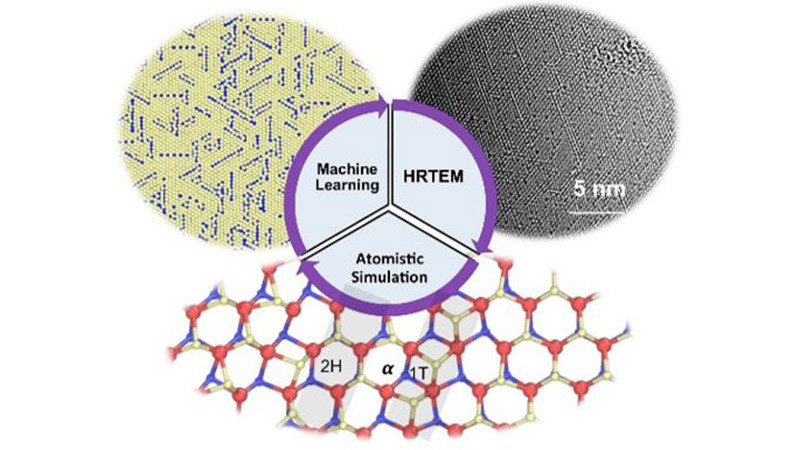 Machine learning (ML), molecular dynamics simulations (MD), and high-resolution transmission electron microscopy (HRTEM) are combined to fully understand phase transformations in a model transition metal dichalcogenide (TMD) layer (MoS2). A defect distribution is predicted as the driver of the semiconducting to metallic phase transformation in MoS2, and validate the prediction with in situ HRTEM experiments. Supervised ML performs structural optimization, identifying the change from a less stable point defect to a more stable extended structure; genetic algorithms with MD identify stable structures. The CNM Carbon cluster performed a portion of the ML calculations and atomistic simulations. Machine learning; Deep neural networks, 4-D operando and ultra-fast pump-probe X-ray diffraction imaging; Bragg Coherent Diffraction Imaging (BCDI).